Although Android phones have their own Internal memory but it is always running out of low space. Most of the memory was occupied by system files and other third-party apps which you've installed manually. This is the reason why people buy SD cards as an external storage device. Unlike pen drives, SD cards are physically very small in size but can be as big as in GB's in terms of memory space. You might have heard it many times that people advice to eject the external device before unplugging it. Even Windows recommend doing this. But why? 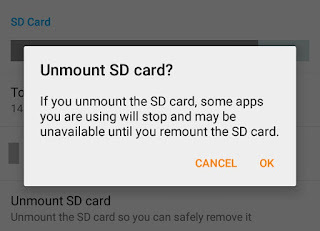 To support this action, Android also has a similar feature named as "unmount SD card", which let you remove SD card safely before unplugging it. Read on to find out everything about this feature. 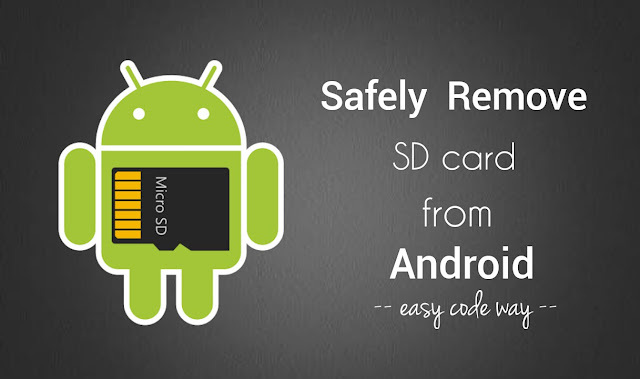 Here I will also guide you how to mount and unmount the SD card in your Android phone. What does mount and unmount actually means? Mounting means that the device has set up the SD card correctly and it is almost ready to use. You can read and write the content in it. Moreover, third-party apps will also be aware of the new change. For instance, if the operation is going on (say if you're moving images to the Internal memory) and you accidentally unplugged the SD card, there are chances that you'll lose your data. But if you'll unmount it first, Android's OS will give up the control of SD card and thus remove it safely. Later on, you can easily unplug it any time. Note that, unmounting is more like that the SD card isn't available. Although, it's physical available but your phone isn't ready to use it. Another common practice is to close all on-going operations, then switch off the phone and finally unplug the SD card. This is another safe way which most of the people use. Now find and click "Storage" option. 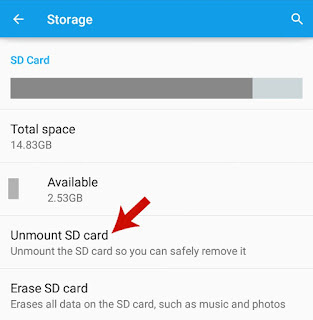 Scroll down and click "Unmount SD card" option under SD card section. Finally a pop up box will appear. Click "OK" to allow permission and that's it. After this, you can safely unplug your SD card any time. If you want to mount it again, go back to the Storage Settings and click the "Mount SD card" option. Note that, after unmounting the SD card, some apps you are using may stop working. This is because, the apps you've installed in your SD card will not available until you remount it again. So this is how you can mount and unmount your SD card in any Android phone. If you've some burning questions in your mind, don't forgot to ask me in the below comment. Stay tuned for more interesting tutorials. What should I do if my phone doesn't have an "unmount feature"?